My grandmother, Genevieve Berry King was a lovely woman. She was so calm and gentle, always with a smile. Sometimes she would get angry, but it didn’t last long, and it was usually for a very good reason: someone hurt a person or animal that she loved, or that person was wrongly accused of something. When you are small, you always think of your Grandmother as “old”. Even though my grandma was old looking, she was very young at heart. My mother said that Grandma always sat in the sunshine in the morning, holding and petting a cat or two or three, however many had gathered around her in the sunshine. It made my mom crazy because she thought that Grandma should be up and bustling around, like she was, and Grandma just sat there with the cats. I think Mom was wrong and Grandma was right, let the kitties calm you first thing before you have to face the world!! My grandmother was an only child. She was born to Christine Pike Berry, who her family called Bessie or Bessie Jane (I am still trying to figure that one out!). When Grandma was born she was named “Geneve Roselle Berry” and she was born on November 21, 1899 in Boston, Massachusetts to Christine Pike Berry and John J. Berry. Christine was listed as born in Chicago, IL and John born in Ireland. John’s occupation was listed as mason. The “story goes” that John was urged by Christine/Bessie to find work in a mine in Nova Scotia (or someplace else, we don’t have any proof) because there was no work in Boston at that time. Well, John did find work in a mine and there was an explosion that killed all the workers including John. Then, supposedly, Bessie would take Geneve wrapped in blankets and walk around Boston in the snow holding the baby “looking for John” and then falling and dropping the baby in the snow. (again, no proof of this) After this time Christine/Bessie was placed in an insane asylum where she lived until she contracted TB and then was moved to a sanatorium until her death. Geneve, by then called Jennie or Genevieve, lived with her grandmother, Jennie Pike. In the 1900 Census (taken 6 June 1900) Jennie Pike was listed as Head of the household which included Christine C. Berry a schoolteacher and Jennie Berry. So Christine had not been put into an asylum as soon as the family story leads us to believe. Genevieve received Holy Communion on May 3, 1914 in San Diego. She attended the Academy of Our Lady of Peace in San Diego. She and George were close and they also had a good friend named Mr. Campbell. He is shown in this photo with the two cousins. Genevieve at the age of 20, more beautiful and still with her long hair piled on top of her head. By the time she had turned 23, she had followed the fashion and “bobbed” her hair. Enter, Myron Tanner King! They met in San Francisco and eventually were married on January 3, 1924. Marjorie Roselle King was born on August 15, 1924. Lorraine Luella King was born on September 26, 1925. The photo to the right is of the family in 1926. Genevieve continued to be a good mother and wife as the family moved from San Francisco to San Diego, and then to Glendale, California. The family stayed in Glendale several years while Myron looked for work in many places. Myron did roofing and other construction type jobs while Genevieve raised four children. Louise (later changed her name to Vickie) was born in Glendale on April 28, 1930 and Myron Berry (Buddy) was born there on July 5, 1935. When Genevieve was in her 50s she went to work at Edwards Air Force Base, the same base that removed her and Myron from their ranch located near the Rosamond Dry Lake. The Air Force wanted to use that part of the desert in Southern California for bombing raids and Grandpa and Grandma King weren’t going for it until they were reminded that the Government could just remove them without compensation. So, they took the money from the “sale” of their ranch and moved into the desert town of Rosamond, California where they bought a small house. She continued to work at Edwards through the 1960s, doing clerical work while Myron sold real estate in the desert area near Rosamond. They lived in that house until their deaths, him in 1966 from a heart attack and her in 1989 from a stroke. She was 9 months shy of her 90th birthday when she passed. My Grandmother Genevieve was raised in tumult and changing times, but she was always a gentle soul and very calm, considering all that her early life brought to her. I remember her saying to me that she would like to show me her “clippings from the newspapers” that she had collected for years. Little did I know then, that her memories and explanations of the “clippings” would have helped me tremendously in my genealogical research! Never underestimate the value of your grandparents’ memories and their “treasures” even if it seems boring at the time!! Grandma Genevieve King was born Geneva Berry to John Berry and Christine (Bessie Jane) Pike Berry. Grandma Genevieve was raised by her grandmother, Jenny Pike until Jenny’s death in 1911. Genevieve was 11 years old and was moved to Rose Greer’s home in Peoria, Illinois until she was shipped by train to live with her mother’s oldest sister, Viv Wiley in San Diego, California that same year. Every morning while brushing my hair I think of Grandma Genevieve, my mother’s mother. GG had long, long hair when I was a teenager. She had long hair most of her life, but in the 1920s she cut it short, a bob, it was called. After she was married, she grew it out long again. When I was a teenager she used to brush her hair and compare her hair length with mine. Even though my hair was long, past my waist, hers was longer. She had strawberry blonde hair until she was in her 70s when it finally turned gray. She would wind it up into a kind of roll of hair around the circumference of her head and she would look wonderful. GG was a fun grandmother. She was always intensely interested in what her grandkids were doing. She wanted to hang out with us instead of sit with the “boring grownups” she would say. She even began to learn how to use Tofu in her recipes because it would connect her with me, who had become a vegetarian and ate lots of Tofu! GG taught me how to knit when I was a young girl. Mama knit all the time and one day while she was knitting and GG was visiting, GG said, “let’s knit Susie, you will like it”. Mama had tried to get me to learn but I wasn’t really interested until GG suggested it. She taught me how to knit “English” style because that was how she learned. She taught me with a very special pair of needles, my Dad’s Mom’s bone size 8 needles. I don’t remember what I knit, I don’t remember how old I was, I just remember that I have knit for a long time and I used those bone needles for many years. Knitting runs in my family, like blue eyes. Both my grandmothers knit. My Dad’s sister knit bathing suits for movie stars in Hollywood when she was a teenager and she knit every pair of socks her husband ever wore while they were married. My mother knit, in fact we would help her pick out a pattern and when she was finished knitting a sweater my sister and I would “borrow” it to wear to school. From the time I learned to knit from my GG, I would go with Mama to the local yarn store. I remember sitting at their big round table in the middle of the shop just fascinated at all the beautiful colors and textures of yarn. The ladies would let me touch the yarn and would encourage me in my knitting no matter how awful it really was. All I remember about those nice ladies was their gray hair and smiles. I now work in a yarn shop and I am the one with the gray hair! I have very fond memories of the Reseda Yarn Shop. My grandmother, Genevieve King, died and left all her “papers” with her oldest daughter, Aunt Margie. When Aunt Margie died, she left all her and Grandma King’s papers with her oldest daughter. Last year, my cousin brought me a CD that her husband had made of all these papers that he had scanned, several hundred! What a wealth of information those “papers” were to me. I connected with a cousin in Peoria, IL that was also researching our Great, Great Grandmother Jennie Pike, so that caused me to really look into all these scanned papers to see what would be beneficial to her research also. I can only share what I have transcribed at this point, which is very little since the handwriting from 1900s is difficult to read and tiny! My Aunt Margie had told me that Jennie Pike had gone to Zion City, IL with my grandmother after my Great Grandmother (Bessie Jane) Christine was put in a sanitarium. Zion City, according to the history, was a city founded by John Dowie. (find info here about him) It was a “special” place for people to live and follow his doctrines of Christianity. Aunt Margie also told me that Jennie Pike had sold “books from door to door for income” while living in Zion City. 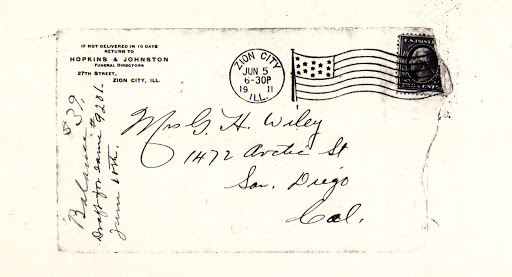 So, when I found this letter that Jennie Pike had written to her daughter, “Vivie” (Genevieve Wiley) I was pleased to read about the history of this Zion City from the viewpoint of a devotee of Dowie and a resident of the city. Your kind and welcome letter was duly and safely received. I have had a kind of relapse, but am better again. The coldest weather __________deepest snow of the Winter is here now. The Zion Community, or organization, which included the religious, political and social rights of every person holding membership in the “Christian Catholic Apostolic Church of Zion”, is dissolving into many separate and distinct individualities as there are members in the C. C. A. Church. In the Summer of 1901, Dr. Dowie bought a large tract of land, used as pastures for milk cows, it was uncultivated and unfenced, with a few scattered frame houses for the use of the people employed in caring for the cattle. 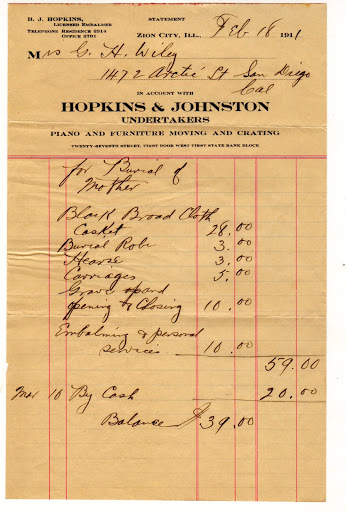 (This was at the time that you were helping us to get ready to leave Nebraska) Dowie was only able to make a very small cash payment, instead of a de____ old fashioned kind of an English Lease, which tied the whole piece of land to Dowie, by a mortgage in which he had to pay the tax on the entire tract of land himself; and in 1905, the entire City with the surrounding Zion land was advertised for sale for un-paid taxes, and this, was the beginning of the trouble which has brought Zion Estate into the Bankrupt Court. Zion City is on the shore of Lake Michigan, in Lake County, Illinois, eight miles from the Wisconsin State Line. The Court which is trying the case under the bankrupt Law, is in Chicago, and the Estate will be sold under the hammer, some time this coming Spring. The only lots that Dowie has sold, are residence lots, and the trouble developed when, the purchasers of those lots, who had built their houses, and were living in them, tried to pay their taxes separately, and the taxes were refused by those with authority to collect, and then, they employed a lawyer to proffer all their taxes at once, but this was also refused, as the taxes on the entire tract had to be made in one payment, and the receipt given to Dowie; he could not raise the money, and thus, the trouble kept brewing, new issues breaking forth, new debts coming to the front and new complainants, crowding into the Court, until the case became such a tangled complication of contradictions and confusion, as never perhaps, before has puzzled a Cos_______ jury of wide-awake Chicagoans. In 1901, there was but one old frame building within the City limits, now, there are the houses, which, were the homes of six thousand people; more than one half of these houses are unoccupied; a very large boarding house, for single people working in the factories is entirely closed, and the large Hotel of 350 rooms, is using only one corner, or less than one quarter of the building. The Administration Building, about the finest piece of Architecture in the City, and being almost an imitation of the Interior Department at Washington, D.C. even to the rich, heavy carpets, which seem to be inches thick under your feet. The Stores occupy two solid blocks, and are two stories high; the upper stories being stores too; they are run on the plan of an immense Department Store. They have many factories here, but more than half of them are closed now, and the others doing a very light business; their fine Publishing House, is practically closed. Zion Tower, one of the ornaments of the City, six hundred feet height, was laid upon the ground a mass of ruins during a terrific gale blowing from Lake Michigan about a month ago. One of the fine features of the City is Shiloh Park, centrally located and being a natural grove is really a very beautiful and attractive place, with several pleasant pavilions and numerous seats scattered about in the cosy nooks and corners nature has provided amongst the trees; and a Well of delicious water, with an abundance of cups, and a cottage with rocking chairs and cradles and awnings and toilet aids, etc. Shiloh Park is the place where they have an encampment every Summer for two weeks in July, which they call, the Feast of Tabernacles. They can set up 15 hundred tents in this grove; they set them up in the form of a City, in Streets, with names on posts at the corners, and a number painted on each tent, and mail is delivered just the same as to houses. I could write pages of interesting description of the tent City, right in the heart of Zion City, from the 14thof July until the frost vacates it, and the people go to take a last drink at Esther’s Well, and look at the large handsome sign “Esther’s Well” over it, which seems to be a Monument for the poor girl, Dowie’s only daughter, 22 years old, who was burned to death by an explosion, one day in Chicago, while the first buildings here were being commenced. The Park fronts on Shiloh Boulevard and on the other side of the Street further down towards the depot is Shiloh House, the residence of Dowie, a magnificent, or, rather a Palatial looking structure, in which the, poor, forlorn phrophet is living as a helpless invalid, unable to move himself, and moved about the house, by two gigantic negroes, who dress and undress him and take care of him as a child is cared for. He is said to be paralyzed, and has been in this condition for about two years; his wife and only son are living in Michigan and have not been here for nearly a year. Poor Dowie, has not been allowed to look through an open door since September and I am told that Shiloh House, is kept like a hot-house. A little further down Shiloh Boulevard, is Shiloh Cottage, which, I thought was a Magnificent Mansion, and must be occupied by some Celebrity, so I inquired of a deaconess, who was walking with me, as to who occupied that noble residence, which seemed to me, to rank next to Dowie’s Forty Five Thousand Dollar home, and I was surprised when she told me, that it was Dowie’s Stable and that he called it Shiloh Cottage. In the corner of Shiloh Park, (nearest to Shiloh House) is Shiloh Tabernacle (fronting Shiloh Boulevard) which is really, the most interesting place in this wonderfully spiritualized and dream-like City of Peace, only forty two miles from Chicago, that Sodom of the last days. And room for five hundred more, and the people who worshipped in the tent were called Parhamites. Then Elder Voliva, notified the members of the C.C. A. Church, that everyone who attended the tent services on Sundays would be excommunicated publically by him, and this is the Third Party, or the Parhamites. When the weather got cold, there were six of the largest stoves I ever saw, set up in the tent. About a month ago, the wind blew the tent down, and tore it to shreds. I could hear the singing in the tent where I was sick. That is all that is available from the letters. These letters are very brittle and some pages are stuck together, so this is all that we can get from them. My Grandmother Genevieve was 7 years old at the time of this letter and in another 4 years at age 11 she would be orphaned and sent to live with “Vivie” in San Diego, California. I am also putting Jennie Pike’s “Last Will and Testament” into this post just for interest. 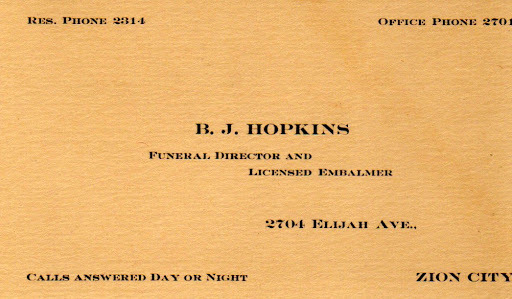 And her funeral bill and info about the Funeral Home. Finding more information on the Pikes has been a passion for a while. Recently, well, in the last 3 years anyway, I have found more places to research than I had available to me when I started the blog. It is always exciting to see your family name in print, especially in an old newspaper. You think, “Wow, more info about this person” until you read what was written and then, sometimes, your reaction is “oh, NO, Not again!”. This is the situation with my great, great Grandfather, William C. Pike. It is nice to hear accolades about him, he was a great professor, or an expert shorthand writer, but then come the accusations of Bigamy! I will put the information that I have gathered from old newspapers in this Post. Your correspondent learned to-day that Professor William C. Pike, the phrenologist, who murdered Jones, the Spiritualist, in Chicago, on Thursday last, for the alleged seduction of his wife, lived in this city in 1866, under the name and title of Dr. William C. P. Robinson. His present wife was a Miss Evans, of Wisconsin, and he lived with her in adultery for some time before being married to her, he having a short time before deserted a wife in Wisconsin, and he is, therefore a bigamist. He is an expert shorthand writer, and at one time published a work on Spiritualism, which he claimed was dictated to him by his wife while in a trance, he taking down her words in shorthand. There are several errors in this information, because, of course the “correspondent” is repeating what came in his telegraph and what he perceives as truth from his experience of these people in “his” city, which was St. Louis, Missouri. The sad thing is that the New York Herald was probably read by Genevieve Evans Pike’s family living in Ticonderoga, New York, the very thing she wanted to avoid. According to other information that I have researched, Genevieve was born in 1837 as Jane Evans in England to Alexander and Elisabeth Evans. The family moved to the United States in 1847 according to a ship passenger list, and were listed as living in Wisconsin in the 1855 Census Report. William met Genevieve or “Jenny” as she called herself, in Wisconsin and was impressed with her spiritualist abilities to go into a trance and “see” past and future. 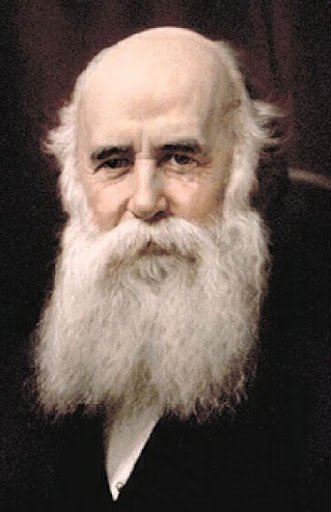 He brought her with him when he returned to Minnesota to his home occupied by his very pregnant wife Sarah and their five-year-old son Albert Eugene Pike. After Sarah asks them to leave they head out to St. Louis, Missouri. Sarah will give birth to William S. Pike in August, in Winona, Minnesota where William C. Pike is still listed as the head of the household on November 1, 1857 in that Census. In 1860, in St. Louis, we find William C. P.(ike?) Robinson as head of household and teacher (age 40) with Gen (age 23) and Wm (age 1) and Alexander and Elizabeth Evans. Alexander and Elizabeth are Genevieve’s parents. 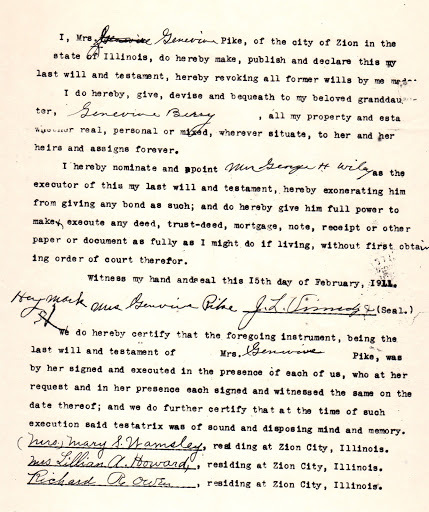 If they were not married then, in 1860, when Genevieve says they are to the reporter when she is in jail, then they were married in 1866, according to The Missouri Marriages 1750-1920 database on FamilySearch.org. Wm C.P. 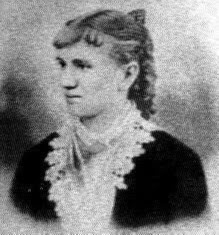 Robinson married Jennevieve Evans 23 October 1866 in St. Louis, Missouri. Genevieve had told the Chicago Tribune Reporter that she and William were married 23 October 1860. So, Genevieve, Jane, Jennevieve, Jenny Evans was born in 1837, met Pike in 1857 (age 20) had a baby boy by him in 1859, married Pike in 1866 (after two other children were born) all the while telling those that interviewed her in Chicago that she was born in 1844 and married in 1860. Wow! What to believe. I have not found proof text when Sarah Pike divorced William C. Pike, although the divorce is spoken of in the trial of William. The “book” that William was said to have written while Genevieve was in a trance, was never published, although that was the reason they lived at the Religio-Philosophical Journal building in Chicago to get S. S. Jones to publish their book. I saw the “book” in my mother’s possession in the 1970’s. It was handwritten, a lot of it in Pittman Shorthand, on old paper and filling a red patterned wooden box. It was called “The Second Coming of Christ” and my grandmother (granddaughter to Genevieve Pike) wanted my mother to decipher the writing and then have my aunt decipher the shorthand. Unfortunately, this did not happen and the whereabouts of this box of history is unknown. Back in 2015 I finished writing the story of William and Genevieve and the “domestic outrage” that caused them to land in jail. The story outlined what I knew about them through research up through 2013. Since that was 3 years ago, things have changed. If you desire a copy of the finished story William C. and Genevieve Pike: A Story of Great Interest please contact me through the comments section. Since that story was finished I sent a copy to the Codington County History Museum in Watertown, SD and they will be featuring a portion of it in their newsletter soon. William Pike confronted his wife, Genevieve, with the rumor that she and S. S. Jones were having a sexual affair. She confessed and signed her name to a pre-written (by Wm.) confession, which was used in court. Pike went to Jones and showed him the confession signed by Genevieve and Jones agreed that he indeed had had an affair with her. They argued a bit about an amount of money owed to Jones by Pike and then, when Pike left Jones’ office, he turned and shot Jones in the head, killing him. Pike turned himself in to the Police, Genevieve was arrested also as an accomplice in the murder, but was later released. She told the reporter of the Chicago Tribune that Pike had been in an insane asylum at least 2 times. Eventually, Pike was given a trial and sent to the Northern Illinois Hospital for the Insane in Elgin, Illinois, where he stayed for 16 years. Upon his release, he returned to Watertown, South Dakota to re-claim his homestead and died there 3 years after his release from the asylum. One thing that I have found in doing the research on this peculiar portion of my family is that lying about oneself was rampant. Maybe the lies weren’t intentional, hard to believe, maybe they were what the person telling the “tale” actually felt to be true at the time. I do know that in my own family there have been accusations of “embellishing a story” to make it sound funnier, scarier, better. However, the people involved in this family, specifically Genevieve and William, had many episodes of altering the actual facts. As the story of Genevieve and William C. Pike unfolds there are some questions that come up. Who was Genevieve and why didn’t she want the paper to know her maiden name? Genevieve was born Jane Evans in December of 1837. She consistently tells anyone and everyone, including the census takers, that she was born in 1844 or thereabouts. She tells others that she immigrated to the United States in 1890, however, she was listed in Census records way before that time in the United States, including Massachusetts, Dakota Territory and Wisconsin. We do not know if she was in the habit of telling outright lies to get what she wanted, or if she did not understand that she was lying. Many of the Evans family members, especially the women, were school teachers and we have received the story through the years that Genevieve/Jennie/Jane did not want her daughters to become school teachers. Interesting. 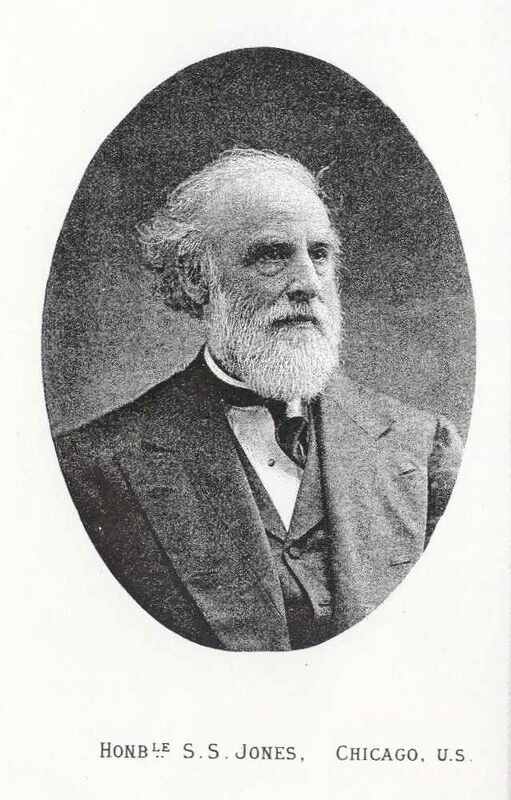 Joseph Pike was the grand-father of William C. Pike. Joseph’s son Robert Pike Sr. was a farmer. The family stories say that Joseph Pike was eccentric and possibly crazy as he rode around the countryside on a horse shouting at people. One of Robert Pike Sr.’s sons, Lovejoy Pike, was contained in Blackwell’s Island Insane Asylum and eventually escaped from there, “never to be heard from again.” This information may be distressing to us who are descended from these people, but fortunately for the later generations, modern medicine has taken away some, if not all, of our eccentricities!! She looked toward the floor and then looked back sharply. Her lips parted and her eyes glared. “Did he?” the question was repeated to her. “Who told you this?” she asked. “No; does he say so? “What does Mr. Jones say?” she asked sharply. Genevieve paused as she thought of the children. They would be in school with their cousins, her sister’s children. Genevieve, the older girl, they called her Jennie, was a mature child and would be doing well in school. Hopefully she would not want to be a teacher, teachers were such underpaid and dishonored people. Rose, such a darling, was she obeying her Auntie? And Christine, they had always called her Bessie, William loved that name. What was Bessie doing? Genevieve supposed she was reading and writing poetry. Even as a small child she loved words. Ah, her lovely daughters, had she given them up for the attentions of Jones? She must never tell her girls what happened here in Chicago. They thought that their parents were lecturing on Phrenology and the Colony, their father’s passions. She hoped they were happy in school with their cousins and that they were obedient. Would she ever see them again? Where was William and what had happened to Stephen? “DO YOU KNOW MRS. ROBINSON?” the reporter’s words seemed to explode in her head, bringing her back to her awful reality. Why did he want to know about her? That woman was not to be trusted. The Pikes had been living at the Religio-Philosophical Building. Mrs. Robinson and her son H.C. also lived in that building. Since Stephen Jones was so opposed to ‘free love’ and because he was also married when the reporter heard the following information from Mrs. Robinson and the Doctor at the scene of the crime, he was probably shocked, even though his plan was to publish in the Chicago Tribune anything he could find out about the murder and the people connected with the murder. Mrs. Robinson told the reporter that Genevieve Pike “lied about everything and begged for money. She lied about being intimate with men and confessed it to everyone who would listen!” The reporter turned to the Doctor after he had examined Jones asking his opinion of Genevieve’s confession of intimacy with Stephen Jones. 1877 was a definitive year for the city of Chicago. The telephone had made it into the city by this time, and later in the year, there would be a great railroad strike. But, on this day, March 15, a life had been ended. “Et Tu, Brute?” was the question Caesar asked as his friend murdered him, but there was not a question of honor on that particular March day. William Pike, Professor Pike as he was known, had made his murderous decision because of the dishonoring of his wife Genevieve. He and Genevieve had come to Chicago to see if they could get her manuscript on the Second Coming of Christ published. They were ardent followers of the Spiritualist movement of the time. They had inquired at the Religio-Philosophical Journal about the possibility of work and of the publishing of the book. Stephen Jones, the editor of the newspaper had encouraged them and even had Genevieve and William write some articles for his paper. William and Genevieve did not understand that Jones’ actual interest was not in the writing talents of this odd and strangely matched couple, but in Genevieve’s womanly virtues. height. Her hair is blonde with a sort of yellowish streak running through it. Her complexion is muddy though not dark, that is it is not clear and fresh. Her jaw is broad, and her wide mouth scarcely closes over strong, broad teeth, not particularly complimented by nature either in color or shape. Her nose, too, has seen better days, before it set an awkward twist in the neighborhood of the bridge. But her eyes are better. They are blue, and wide and clear. There is not much womanly sympathy in them, nor a ‘wonderful depth of womanly love,’ but they are sharp and in a measure calculating, and tell the story of the woman’s life of anxious care for herself and intense affection for her own interests.” This reporter’s observations of Genevieve sound harsh. Did he really know something about her? Did he just give a depressing view of her appearance because he was suspicious of her? What did he know about Stephen S. Jones. “On the 3d day of August, 1873, the Rev. Moses Hull published in Woodhull & Claflin’s Weekly a “statement,” which created a decided sensation throughout the ranks of Spiritualism—not, however, on account of its intrinsic merit, but on the contrary, in consequence of the unblushing impudence and boldness manifested in advocating licentiousness as a virtue, and the desertion of one’s family and offspring as an act to be commended, more especially when the husband has a large brain! But now, here is a half-crazed man admitting to the murder of Mr. Jones because Jones was having an affair with Genevieve Pike, the man’s wife. Was Pike to be believed? Was Genevieve really the woman responsible for this murder? Was Jones really involved in “free love” after all? That is what makes William C. Pike infamous! He has quite the colorful background that causes many people pain and confusion. His life is lived in and out of reality, yet he is the man that gave life to my great grandmother, grandmother and mother. This blog is an exploration of the life of William C. Pike and his family members. Some of his family rejected him, others just ignored him. We, his descendants can not ignore him, for his genes are our genes, like it or not. So begins the story of William and Genevieve (Jennie) Pike as told by their great-great-granddaughter Susan Schack Jensen. The research was begun by my mother Lorraine King Schack.